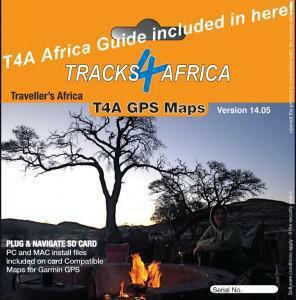 If you bought Tracks4Africa Maps on a SD Card, you do not need to despair. You have Africa at your fingertips! With the help of the Africa Guide, which is on your SD Card, you never ever have to get stranded, not knowing where to sleep, buy food or get emergency help. You can even read up on nearby attractions and activities! The Africa Guide is loaded onto T4A GPS Maps SD Card. If you have a Garmin GPS and use Tracks4Africa GPS Maps, you can literally look up a whole continent of information while you travel. Because the information is downloaded onto a SD card you don’t need an internet connection to browse the Guide. 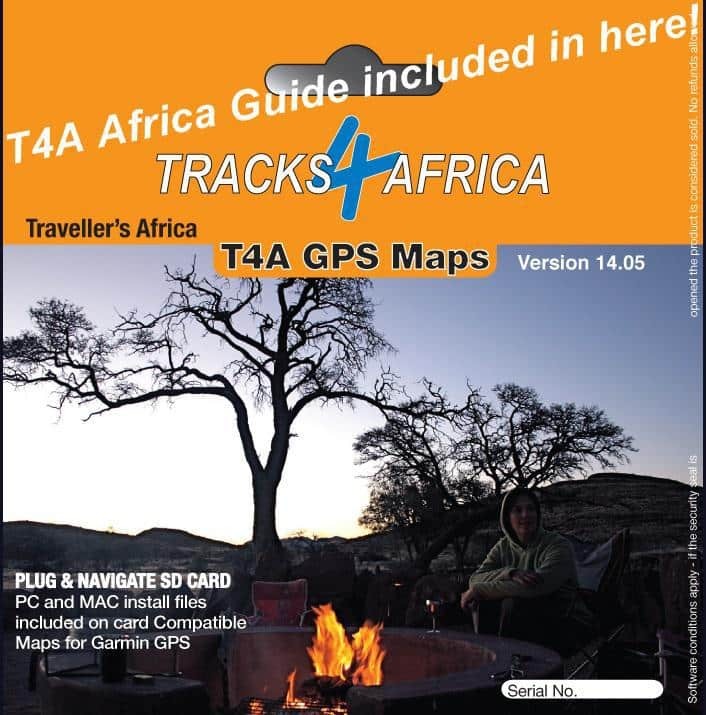 Your GPS will find your location via satellite which enables the T4A Africa Guide to find accommodation, or whatever it is that you need, nearest to where you are. The newest version of the Africa Guide (14.10) has information on 49 232 Points of Interest (POIs) relevant to the self-drive tourist and will be available on our new SD card release from leading outdoor stores by mid October. 6 272 Places to stay with contact details, rates, facilities and activities. 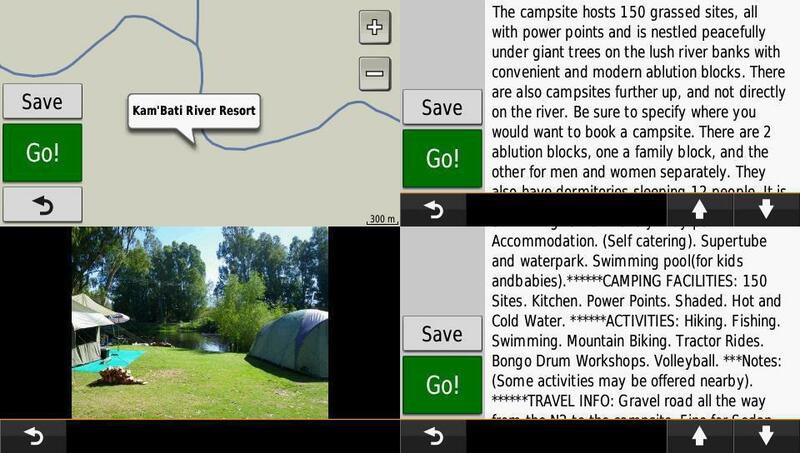 2 437 Campsites with contact details, rates, facilities and activities. 1 004 Activities like abseiling, adventure, angling, archery, bird watching, boat cruises and many more things to do. 1 713 Attractions like animal sanctuaries, aquaria, archaeological sites and arts & culture POIs. 561 Border control information include opening times of immigration and custom offices. 7 312 Communication POIs helps you to know where to buy airtime, get an internet connection, wireless, mobile phone reception or the closest phone. 742 Protected Areas with descriptions of national parks and game reserves. 693 Scenic Routes such as mountain passes and game drives. 6 997 Shopping POIs – there are several subcategories to help you find the kind of shop you need. 16 140 Towns – indicating what facilities and services are available. The Guide offers as much information of POIs as Tracks4Africa has available, including a photograph if we have one. These POIs can be accessed in various ways, depending on the GPS model you use. On most models you can find it in three easy steps. 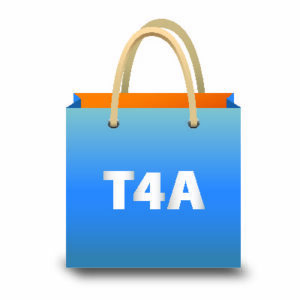 Go to Where to, Extras and click on the T4A Africa Guide. Under the guide you can then search the different categories. 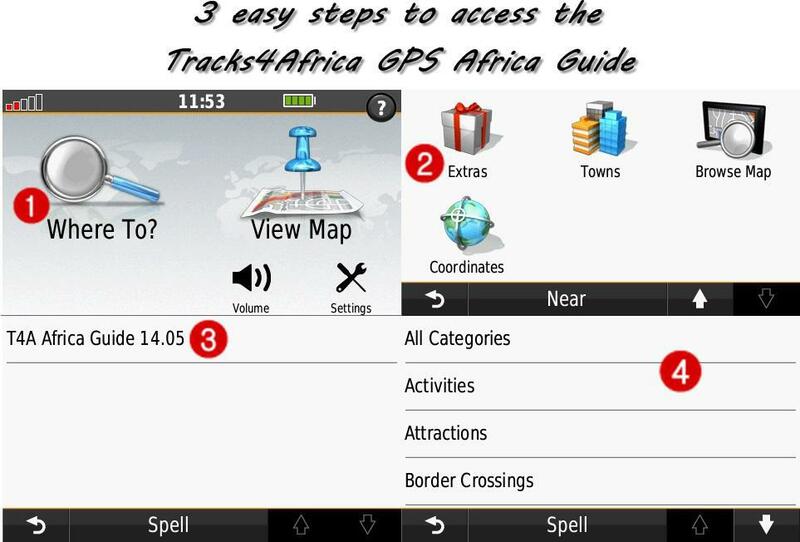 Three easy steps to find information on the Africa Guide. The Africa Guide is compatible with basically all Garmin devices. See our website if you are experiencing any problems with the guide on your device.